Thank you for checking my site. such as concerts, Cd’s etc. For those who are interested in my Guitar lessons or Vocal Coaching in the Netherlands don’t hesitate to have a look at the appropriate segments. This Cd will appear in 2013 and will contain some of my best songs and pieces I wrote over the last decades. 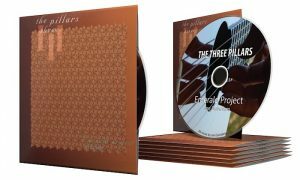 The CD “The Three Pillars” originally from January 1996, is re-issued (june 2012). In the meanwhile I keep on working on my new CD “VIAJANDO“. The first album of the ‘Emerald Project’ (1996) is a unique combination of folk, classical and World Music, and brings together influences from the Spain and the Middle East. Although the music creates an atmosphere that is essentially serene and still, it conceals a power and hidden passion that is reminiscent of traditional Sufi music. There are moments when the guitar seems to sing, when the chords evoke a poignant sense of solitude and yearning. This harmonic music has been recorded ‘live’ in a rural church between midnight and sunrise. For most part the music is performed on one or two classical guitars; one piece is performed on an epinette, an instrument similar to a dulcimer, with melody and bourdon strings. All the recordings on this album are composed and performed by Jan Duindam, accompanied on five of the pieces by the guitarists Wilco Tukker or Fouad Tan, who also designed the original cover of the CD. The piece ‘Toward the One’ is a solo rendering on the epinette. This first CD of ‘Emerald Project’ has been received very well. I believe that we need the deeper kind of flowing, haunting incantations of beautiful music and sustained throughout a CD so as to allow deep journeys and continuous voyage and healing. So many CD’s ‘jump’ from mood to mood and do not sustain vision or flow. You have a real gift for melody, too, which I find few composers have today. From Southern Africa to Southern Spain with “The Three Pillars” from the Emerald Project (ORS 54692). This is beautiful guitar music, full of emotion and yet not overpowering. This has also been one of the most popular Oreade CD’s this Autumn.